Every once in a while, we need a good snort. Something deep. Something loud. Something that almost makes you wet your pants – snorts. So, for this afternoon’s amusement I thought I would share with you some jokes. Not just any jokes but PIGGY jokes. You gotta love that, right? What else did you expect? I am a happening oinker. 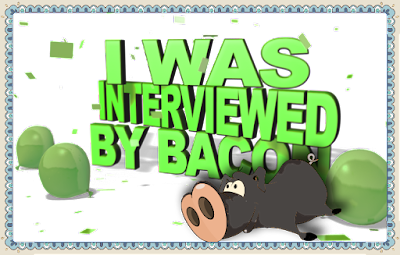 So buckle up, put your drinks down and read the following humorous jokes submitted to me by some fellow piggy lovers. Hope you enjoy my friends. Have a piggy good ole day! MOTHER PIG: What did you learn in school today? THIRD PIGLET: I’m taking a foreign language. FIRST PIGLET: How do you know your boyfriend loves you? SECOND PIGLET: He signs his letters with lots of hogs and kisses. What do you get when you cross a pig with a dinosaur? – A porkasaurus rex! What happened to the pig who lost its voice? – It became disgruntled! Bashful sweet Bashful finally made in home to the Hotel Thompson this weekend. He came riding in on his skateboard that he got for Christmas at Misaki’s. He was tired, had jetlag and had a LOT of explaining to do on his travels back home. I let him get some sleep but told him we needed answers. Over breakfast this morning, he told us that he had an awesome time with Misaki and family. He spoke of fun playing cards, riding his skateboard down some ramps, getting some beer and seeing some sights. He also said it rained a lot more there than here in south Georgia – snorts. He has memories that he will never forget and so much fun! And he brought home some gifts. A piggy coaster that reads, “The best way to behave is to misbehave”; some seaside rock candy in the star (really delicious! ); some Percy Pig candies (I can’t get enough of these! 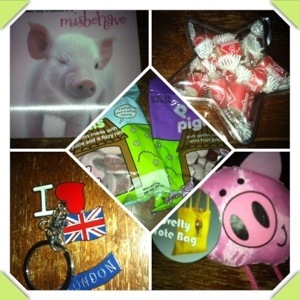 ); a wonderful keychain to remind me of my travels and a pink piggy tote bag. Thank you Misaki so very much for the treats, the kindness of hosting my Bashful and showing him a great time. I think he even came home with the cutest little accent! I am so jealous of it. He has definitely gotten the rock girls heads turning here at the Hotel Thompson with that accent – snorts. AND, Bashful came home with a friend. Misaki said he was “sweet but slightly dim”. I think they got into great trouble traveling together on the way home. It could account for his interview with Rolling Stone magazine – snorts. 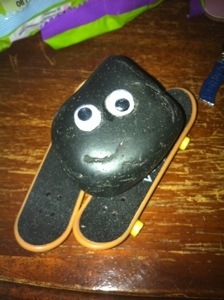 May I present to you the newest member of our rock clan – Benedict Cumberock. Really Bashful? 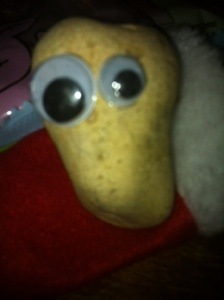 Bashful is MIA from his travel to Misaki’s. 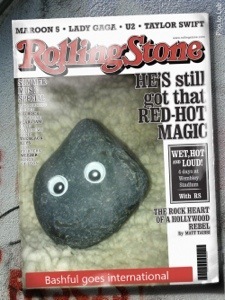 I got my issue of Rolling Stone magazine today (hey, I’m a happening pig that likes to read) and guess who is on the cover? Bingo – that Bashful of mine. Apparently while he was in London, he got interviewed. Shaking my piggy head. So maybe this tells us where he is now. Living large with royalty and rock stars? Bashful, if you are reading this. You get your rock hiney here right this instant. You have obligations waiting for you. If you are not home by this weekend, I will send authorities out to get you.